In the present paper, we analyse long-period (LP) events and seismic noise recorded at Campi Flegrei during the uplift episode of 2004–2006. The results of a detailed polarization analysis indicate that the large number of LPs detected during the seismic crisis were accompanied by a sustained activity consisting of very low-energy volcanic signals. These weak volcanic signals, which are usually absent in ambient noise recorded in the studied area, and LP events have similar properties, namely they are radially polarized towards the same LP source. The large dataset analysed allows us to study the statistics of the polarization, leading to the extraction of the average properties of the volcanic signals. An estimate of the complexity of the system can be provided by the degrees of freedom necessary to describe the asymptotic dynamics in a reconstructed phase space. 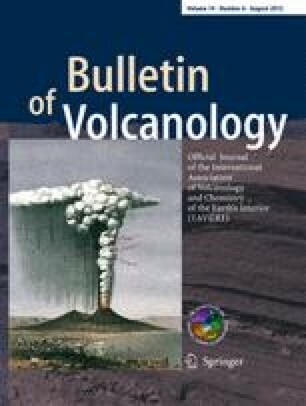 This analysis shows that both LPs and low-energy signals can be described by a low-dimensional dynamical system, while ambient noise unrelated to volcanic activity is higher dimensional. Based on these observations, we interpret the phenomena observed during the seismic crisis in the framework of the theory of self-oscillating systems, in which LPs and low-energy signals represent self-oscillations generated by a persistent hydrothermal source. We are sincerely grateful to Francesca Bianco, Enza De Lauro, Salvatore De Martino, Edoardo Del Pezzo, Margaret Hellweg and an anonymous referee for their useful comments and suggestions that improved this manuscript. The Mobile Seismic Network team of the INGV-OV is acknowledged for having provided the data. The CircStat package (Berens 2009) has been used for the circular statistical analysis.